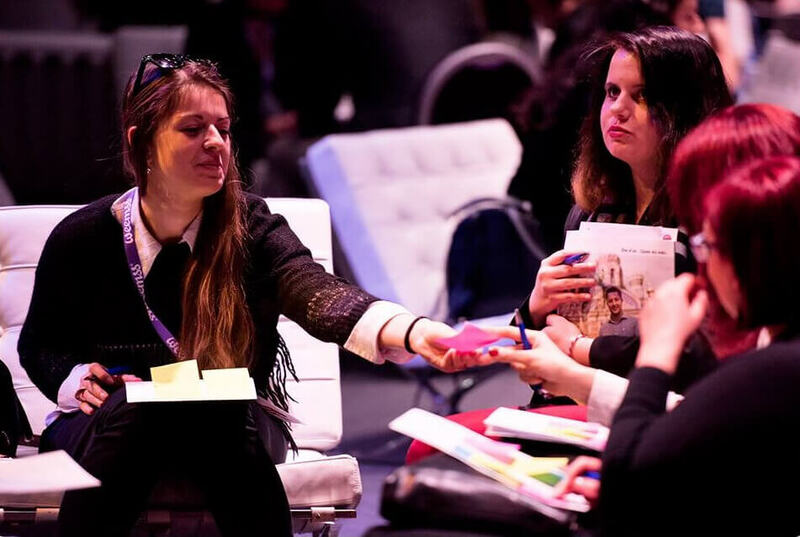 A good icebreaker at the onset of your conference can set the tone for your event, boost audience engagement and create the right conditions for networking. It’s a valuable first impression you want to make. Know what you want to achieve with your icebreaker. Is it to help people get to know each other, start collaborating, or engage with speakers? The simpler the activity, the easier it is to engage in it. Just make sure it helps you reach your event objectives. Remember that people have different values, beliefs, and experiences. Get in your audience’s shoes and be considerate of them. Here is a list of our favorite icebreakers. We use many of these regularly at our own events, but some are inspired by events we’ve attended. We hope you’ll find them useful. Getting to know the people in the room is a crucial part of every conference. And yes, obligatory introduction rounds are usually pretty awkward. Try something different. Put participants in pairs and let them interview each other. Give them five minutes to learn about one another’s background, professional experience or passions. This is Peter; he lives and breathes technology. He built his first robot at the age of five. He’s now working as an innovation lead. He also loves skydiving. Not only will you make the introductions less stiff, but you will also help people to connect. Credits for this activity belong to Lukas Bakos, Managing Director at Maxman Consultants. 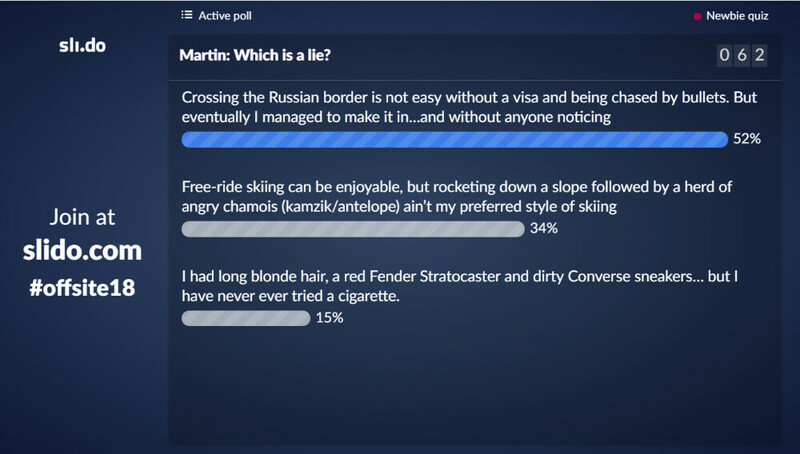 Live polls are one of the easiest ways to break the ice and capture your audience’s attention. They work especially well if you want to engage larger crowds at conferences (50+). As part of your opening remarks, use a fun poll to loosen up the atmosphere. Polls are also a great way to set the tone for your event. Here are a few examples that we love, all gathered from our clients. How energized are you feeling right now? If age is only a state of mind, what is YOUR state of mind right now? Funny icebreaker polls will help your audience to connect and loosen up the atmosphere. You can use live polling for much more than just cracking people up. Relevant content is the backbone of every event. To ensure it is fine-tuned to your attendees’ needs, kick off with an icebreaker poll to discover their expectations and learning objectives. What do you expect to get out of this event/training/workshop? Using one word, what themes do you want to hear about? What’s your level of understanding of the topic? Use icebreaker polls to discover people’s expectations and learning objectives. This dynamic icebreaker is really something. It can skyrocket the energy levels in the room and get people super excited. It’s inspired by Eric de Groot who used it to kick off his presentation at TEDxFryslân. Eric aimed to demonstrate how easy it is to change people’s behavior. He invited everyone in the room to stand up, grab paper that had been previously handed out and crumple them up into small balls. Then he instructed people to throw the paper balls at a target in the room once the music started to play. The result? An instant party. We took it to the next level at our internal training session. We handed out pens and paper and prompted participants to write down their personal challenges. Then we instructed them to crumple up the paper into balls and counted down before throwing them in the air. After this, everyone grabbed the nearest paper ball and read out some of the anonymous challenges. This icebreaker was not only a great energy boost, but it also helped reveal some of the most serious hurdles our team members face. This icebreaker works well for both small groups and large audiences. People are asked to share two true facts and one false statement about themselves and the audience guesses which one is the lie. We use it to introduce our new hires in the form of a Newbies Quiz. It’s a nice way to take the pressure off people and make the introductions fun. Newbie quiz is a fun way to introduce your new hires and help the team get to know them better. 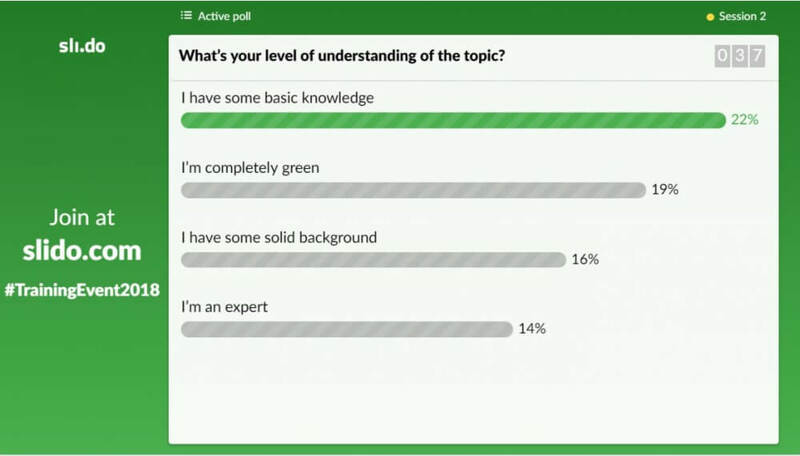 Present the three statements in a live poll and encourage the audience to guess which one is false by real-time voting. Make sure you hide the results before you activate each poll. Once people have voted, invite each person to tell the story behind each answer option. To pull this off successfully, appoint a moderator who will guide the audience through the quiz. Once you have enough votes, comment on the results or prompt people to share the story behind each answer. People love stories. And they can learn a lot from them. At the FRESH conference in Copenhagen, facilitator Martijn Timmermans split the audience into groups of five and gave everyone one task. They had to write a story about the most innovative event they had organized. In the first step, people were given 10 minutes to reflect and note down key points (pen and paper were provided). Then, taking turns, group members narrated their professional achievements to the rest of the group. This way, Martijn created an environment where people not only inspired one another but also connected on a personal level. Have you ever played bingo? Try giving it a new spin. This icebreaker will get people interacting and knowing each other better. Prepare 5×5 bingo matrices filled with a series of personal or business-related statements and hand them out to the attendees. Have you ever fallen asleep during a conference call? Have you been with the company for over 10 years? Instruct the participants to interview each other and tick off the boxes that apply to each person. The person who completes the card first wins. If done right, a Q&A session can easily become the most interactive part of any panel or presentation. But it often suffers from a lack of spot-on questions. Q&A tools like Slido can help you bring audience questions to light (and to the stage). The real magic happens when you use the collection of questions to turn them into an exciting icebreaker. Before you open up the Q&A, prompt people to talk to their partners (or trios or any other configuration feasible with the room seating) and have them come up with one question each. Then instruct them to present their questions to the group and to collectively decide on the best one. Turn people’s questions into an icebreaker activity that will stimulate collaboration. After that, get them to submit their own winning question through Slido. While they do it, they can also review the questions submitted by others and upvote the ones they like the most. The speakers or panelists will then address the questions with the highest support of the audience during the Q&A. Credits for this activity belong to Miranda van Bruck, Creative Director at The Content Studio. We’re all children at heart. Even the most serious managers turn to playful kids with a bit of competition. At a recent full-day workshop, our facilitator Lukas Bakos prepared an ongoing quiz competition to keep us engaged from 9.00 a.m. to 5.00 p.m.
Lukas split the group into pairs and tasked everyone to write their TOP 10 on a certain topic (from the 10 most visited sites according to Lonely Planet, to the 10 best-selling cars in history) for each round. The rounds were spaced out after breaks throughout the day, so the group had an incentive to get back to the room on time. With a three-minute limit per round, the groups were told to write down their answers and were awarded two points for each correct answer. The score was kept on a flip chart for everyone to see. At the end of the day, the winners received a prize in the range of 0 to 10,000 euros in the form of a scratch card. Coffee breaks are seriously underused at events. While some people have mastered the art of networking at events, others might need a little nudge to help them start conversations with strangers. At Eventex 2016, meeting designer and facilitator Jan-Jaap In Der Maur encouraged people to network through coffee break assignments. Before they left the room, he instructed the participants to meet three new people during the upcoming break and ask: What’s your story? How did you get to do what you’re doing? Freshen up your traditional coffee break with a fun icebreaker activity to help people connect. After the break, Jan-Jaap got people to pass around the Catchbox — a throwable microphone — while music played in the background. When the music stopped, the person holding the microphone shared one of the stories he or she had learned during the break. Icebreakers are powerful kick-offs to any event or conference. They will help get your audience more engaged and make them feel more comfortable within a group of strangers. All of these icebreaking activities will motivate your attendees to interact and create valuable connections.